Conflicting messages? Aldi Süd promotes additional brand offers (left) at the same time as it aggressively fosters its private labels (right). Aldi Süd in Germany is considering price promotions for brands. Lebensmittel Zeitung suggests “a paradigm shift” is looming as the discount retailer is “seriously contemplating” the introduction of special offers for leading manufacturer brands, of which Aldi has listed several dozen over the past couple of years. With the listing of brands, Aldi has increased its comparability and interchangeability with other discounters and supermarkets that do price promotions regularly, especially for the most popular products that Aldi has been listing; the article suggests. This is why it will now have to become more price aggressive, especially as its self-image was that it was better than Lidl in terms of quality and price. 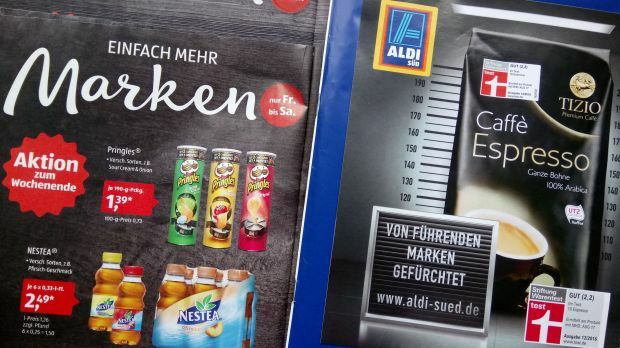 Aldi Süd has gained experience with weekly price cuts for private labels as well as brands in its Hofer-controlled markets, particularly in Central European countries (Hungary and Slovenia), but also in Switzerland and on occasion in Austria. Aldi Nord has been more hesitant, but operates similar price activity in Poland and occasionally in Belgium. In Germany, both Aldi Nord and Süd have been promoting using crossed out prices for fresh goods for some time, including vegetables, meats, but also bread and sausages from the standard range. The name 'discounter' couldn’t be more wrong for Aldi, a retailer that avoids price discounts like the plague. Up until recently, crossed out prices for limited periods of time had been banned at the world’s leading discount store retailer. If they were used at all it was for long-lasting permanent cuts, a statement of reliability and persistence. Temporary cuts only suggested, in the opinion of the Aldi management, that the regular shelf price was too high, undermining price worthiness. However, Aldi reportedly found that customers don’t think that way. Not any more anyway, when a flight to Marbella, a fancy watch and a fillet of beef can all have the same price, or be thousands of euros apart. What may still be true is that permanent prices create loyalty. When a price stays the same for many years – and this still applies to plenty of products on Aldi’s shelves – customers will stop looking at the price tag every time they shop. In this way Aldi, who sees bargain hunting as a plague, has driven this shopper behaviour away. This plague that it has avoided successfully for many decades is now coming back with the introduction of the top brands in its stores: Leading brands go hand in hand with special offers, after all. Aldi’s fundamental endeavour to appease the market and with it the price development is being thwarted when it comes to brands – since these are the stronghold of all the others, but not Aldi. Its not that Aldi hasn’t tried. When it listed Coca-Cola in 2012, it observed the market development and then, a year later, felt forced to cut the price by 10% due to repeated competitor promotions. This price set in autumn 2013 is still written in stone – meaning there hasn’t been a single day with a higher or lower price for this heavily-promoted, leading brand at the leading discounter. Nevertheless this doesn’t work for all. Once you’re in, you’re in, for better or worse; and you need to start to compromise. It seems that Aldi itself doesn’t know what it wants. It looks like it doesn’t like brands, but it needs them. At the same time as it featured “simply more brands” in its leaflets last month, it was simultaneously running the billboard campaign “feared by leading brands”, promoting its award-winning private labels. So, what’s the commitment? Something for everyone? Aldi is not experienced in promoting brands instore. As soon as it starts doing price promotions, it will have to deal with a big issue that it has conveniently been able to avoid for decades – promotional planning of volumes. What is the correct order amount for that price? Remainders can be plenty in a volume-driven business. What if a competitor has a lower price at the same time? So much to think about. Aldi doesn’t really know brands and it doesn’t really want them. It’s not really clear that they help, taking into account the enormous effort involved and efficiency concessions that have to be made. Of course sales go up if I add a second, say, deodorant to my range which is three times the price of my own brand. Along the way Aldi will be learning; and as a late starter in brand marketing, it may be learning a bit more. More than likely the customers like it – and surely that’s what it is all for.